The Senate voted by 60 - 39 to limit debate on the health care bill, setting up a vote for final passage tomorrow at 7am ET. Debate continues on the bill this evening. As part of this continuing debate, the minority (the Republican caucus) was allotted one hour for remarks. As part of these remarks, Sen. David Vitter (R-LA) asked that the bloc be divided evenly among several members of the Republican caucus. 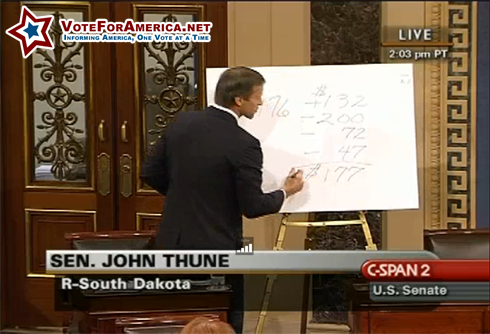 John Thune (R-SD) received the third segment which can be viewed in its entirety below. Sen. Thune directed much of his ten minute address to the issue of the deficit. He began by presenting convoluted percentages of non-defense budget spending over the preceding several years. He was attempting to illustrate that the Democrats contributed more to the deficit and that our current deficit is not attributable to President George W. Bush or the Republican party. He then lifted a blank presentation board and a marker. Next, he began to write numbers, in billions of dollars, relating to the Congressional Budget Office's estimate of the Healthcare bill's cost. The first number represented the CBO's estimated surplus ($132 B), over a ten year period, resulting from the implementation of the Senate's Healthcare bill. The next few lines depict Sen. Thune's interpreted inaccuracies of the CBO's estimate. His numbers don't add up to -177; the correct computation yields -187. We have a US Senator attempting to illustrate why the CBO is wrong and he can't add four numbers of three digits or less together. Simply stunning. But perhaps what's even more stunning is that nobody caught this error; either in the planning stages or during the remaining remarks.